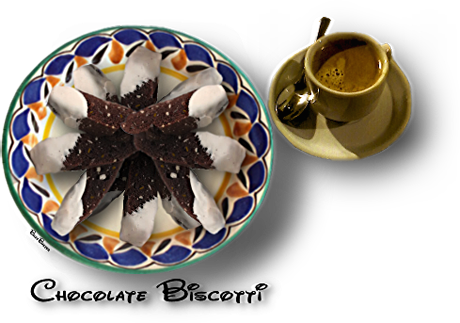 An Italian twice baked cookie, especially favored to accompany a good strong coffee. Chock full of hazelnuts and chocolate chips and dipped in white chocolate. A perfect companion to a hot cup of caffè espresso. 1. Preheat oven to 325°F degrees. 3. Add nuts and semisweet chocolate chips. cookie sheets and bake for 30 minutes more. 9. Cool biscotti completely on racks before dipping in white chocolate.